Ohio Paving & Construction is a full-service asphalt parking lot paving and contracting company in Cleveland, servicing surrounding communities including Cleveland, Mentor, Strongsville, Youngstown, Westlake, Parma, Lorain, Cleveland Heights, Garfield Heights, and North Olmsted. For large projects outside of this area, such as Sandusky, Columbus, Toledo, or Cincinnati, we are happy to fulfill your needs through our extensive network of contractors. Please note that while we are happy to perform paving and construction work on commercial properties, we are not taking any residential clients at this time. Contact us or use the form below to get the conversation started. Paving in Cleveland is notoriously ongoing due to the weather effects of the Great Lakes- an unfortunate reality of our geography. Therefore, finding the right commercial paving company to meet your needs is vital to keep costs down from year to year. Ohio Paving & Construction proudly services large corporations like Nestle, Giant Eagle, and the IX Center for the paving projects and maintenance programs they need to keep appearances sharp and paving costs low. When it’s done right, you’ll know it. 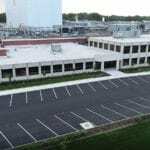 Ohio Paving & Construction offers the full catalog of asphalt parking lot paving and repair services to Cleveland commercial properties. Every job we complete is guaranteed to be complaint with ADA regulations. See our services below, as well as some examples from our project portfolio for a visual concept of what we will deliver. 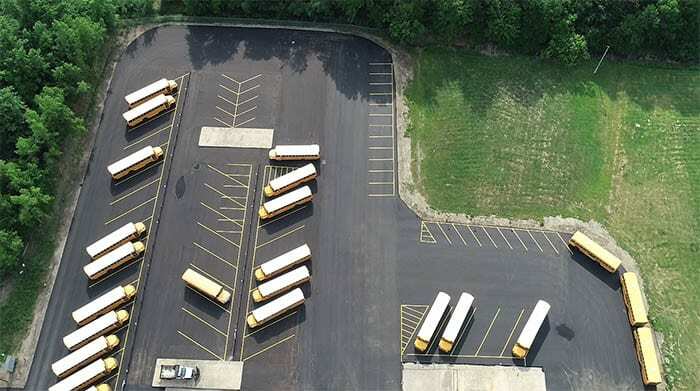 A new asphalt parking lot developed for the Willoughby-Eastlake Public Schools bus garage, complete with line striping and asphalt sealcoating. Asphalt Parking Lot Construction. See the work we did for Nestle USA in Solon, OH. Asphalt Resurfacing. See the work we did for Parker Hannafin in Wickliffe, OH. Asphalt Milling & Paving. See the work we did for Giant Eagle in Beachwood, OH. Asphalt Sealcoating. See the work we did for the Divine Word Catholic Church in Kirtland, OH. Parking Lot Line Striping. See the work we did for Old Dominion in Garfield Heights, OH. For those interested in maintenance, low-cost asphalt paving work, we specifically outline everything you need to know in our asphalt parking lot maintenance page. Keeping up with maintenance tasks consistently can lower paving costs down the road. 99% of the time, our clients come to us with a parking lot that has been damaged from years of wear and tear, usually with little maintenance taking place in that time. In these cases, the best mode of repair is an asphalt overlay, also known as asphalt repaving or asphalt resurfacing. Our experienced team of engineers and asphalt paving specialists will determine whether or not your parking lot must be milled and grinded before repaving to maximize the lifespan of new asphalt. Then, we will apply a new surface layer of asphalt to your commercial lot or pavement, and line stripe and sealcoat (if you so choose) the finished product to make it beautiful and functional. Asphalt is a mixture of aggregate particles, like sand and gravel, bound together by bituminous product, a semi-solid form of petroleum. A new asphalt parking lot begins with an aggregate, such as gravel, with a layer of finer gravel above. This is known as the “sub-base,” and is generally around 6″ thick. Once the sub-base is compacted using a heavy roller, the first layer of asphalt of about 2.5″ is laid and compacted. Last, the surface layer of asphalt is laid and compacted at between 1.5″ – 2″ thickness. Thickness of asphalt layers are not always constant. 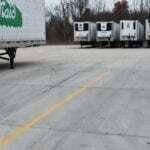 The most common depths for an asphalt parking lot in the Cleveland, Ohio area is 4″ or 6″, chosen by a careful determination of the traffic’s net weight, drainage quality, and temperature variation that the parking lot will endure. Naturally, the surface layer will accrue the most damage over time. A parking lot with structural damage on the surface does not need to be replaced, instead, Ohio Paving & Construction will resurface the pavement by removing the surface layer of asphalt and applying a new asphalt layer of the same or similar depth. Asphalt is a very “green” material, as its millings can be recycled to be used in a future asphalt parking lot construction or resurfacing. New asphalt paving rarely is laid without the addition of other services, including new parking lot construction, line striping, and drainage repairs, like for the Abrams Creek Baptist Church parking lot here. The following prices apply to new asphalt paving jobs 4″ in depth. The following prices apply to new asphalt paving jobs 6″ in depth. The distance of the job site from our crew. The state of the land and/or sub-base where the asphalt might be laid. The amount of time/effort is necessary for cleaning. Just as landscaping and brick-and-mortar curb appeal make an impact, the appearance of a parking lot makes a very clear statement about the professionalism of your establishment. Everything the customer experiences, from puddling to potholes to faded parking spaces, will impact the impression you give to the outside world. What’s more, these experiences can leave permanent blemishes on your business – think poor Google or Yelp reviews- which have measurable impact on future business. In fact, one study found up to 70% of first time sales were credited to the business’s curb appeal. It’s clearly a worthwhile investment to maintain a quality parking lot. So, where do you go from here?